This chapter introduces the basic concepts necessary to use the XEO framework and learn XEO's approach to development. XEO was designed from scratch with the purpose of modeling real-world entities using an object oriented approach, as the team felt that that was the most natural way of developing an application. Being able to create an entity, its data model and web pages for listing all instances of that entity (with options such as ordering and grouping), editing single instances and searching a particular instance, while still being able to use customized logic to implement behavior and without dealing with all the low-level complexities was truly the ultimate goal. Developing starts by defining a set of entities (XEO Object Models) and their properties, using XEO Studio's Object Model editor (a graphic editor for a specific XML language that is used to represent said XEO Object Models). The "XEO Builder" then processed those entities to generate the data model and support classes to interact with instances of said entities. Using the Object Model as a base, web viewers for listing, edit and search instances can be "scaffolded" (think Ruby on Rails) by XEO Studio. An Object Model is the XEO representation of a business entity. Almost every business entity can be described with a number of "attributes" and relations with other entities (be it relations of extension, 1-1 relation, or 1-N relation). For example, if we're modeling a entity that represents a "Book" in real life, that book would probably have attributes such as the book's title, the book's ISBN, the author's name, the edition number or category list (drama, romance, etc...) of the book. In the following section, you'll learn how more about attributes of a XEO Model. Each of those types of attributes have specific properties which can be set to customize the attribute's behavior, which you'll see further in the documentation. These properties vary with the type of attribute, naturally. For example, a Numeric attribute can have a property maxValue and minValue (which specify maximum and minimum values the attribute can hold) while a collection attribute can have the maximum number of instances to which the first can relate to (or declare the type of Object Models to which the first can relate to). 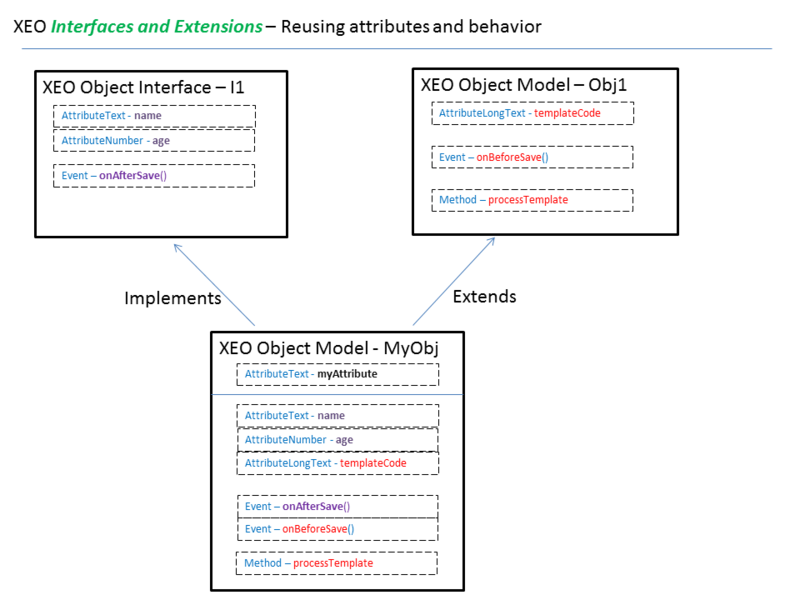 Each instance of XEO Object Model has a set of predefined attributes which are used by the framework for various operations. Here's a list and description of those attributes. BOUI - (Business Object Unique Identifier) - Long, representing the instance's internal identifier. Relations between instance objects are done using the BOUI, security policies are based on the BOUIs, also. PARENT - The BOUI of the parent instance object for this instance. Let's take a look at the possibilities for defining business logic in an Object Model. Attributes themselves can have logic associated. For example, a certain attribute may have a default value that is calculated, or its value may need be validated when it changes (and that validation, may required more or less complicated operations). Hidden When (code that will determine when the attribute is hidden - this logic is directly associated with the viewers layer. 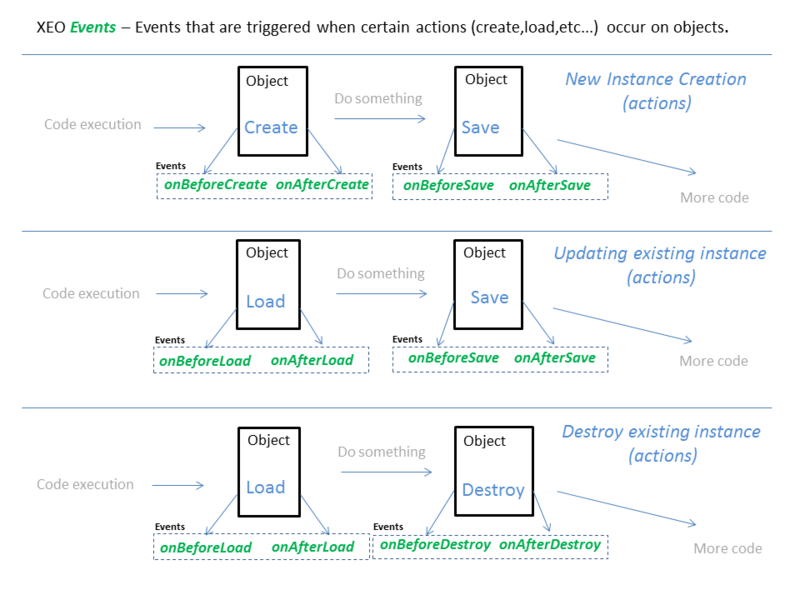 In figure Concepts.1 is depicted the XEO Events mechanisms and when they are triggered given a certain action performed on an instance object. Using XEO, business logic can be created right along side the model of the entity, in the form of "Methods". 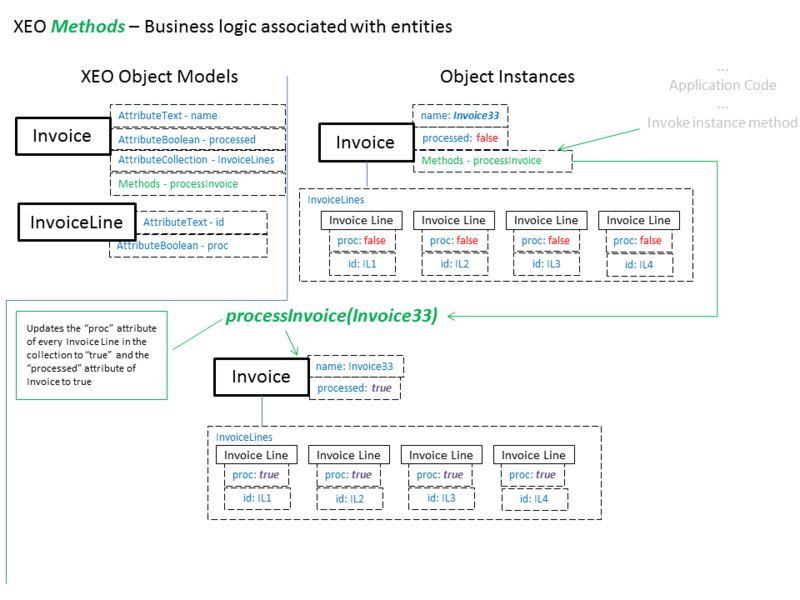 Methods are entry-points in a XEO Object Model to declare business logic associated to the entity; those methods will be available in all instance objects and can perform any desired actions. Imagine, for example we're dealing with Invoices (each Invoice has several "Invoice Lines" and each of those lines has a state indicating whether it has been processed or not). The Invoice entity has a flag (true/false) which determines when that Invoice has been processed (an Invoice is considered processed when all its items [Invoice Lines] have been processed). At a given point in time in the application, some action occurs and the consequence of that action is that a certain invoice should be considered "processed". Using XEO Methods, we can define a processInvoice method (which will be available to all instances of the Invoice XEO Model) that will check every Invoice Line of the instance and set its processed attribute to true and in the end, change the processed attribute of the Invoice to true. By declaring a method in a XEO Object Model that behavior becomes available to every instance; furthermore if that Object Model is used in another application that behavior is taken along with the Model definition, there's no need to "hunt down" the code in the application's logic layer. In figure Concepts.2 is depicted how the process of defining and invoking a XEO Method on an instance object works. One important factor when creating a business application is security (including permissions). 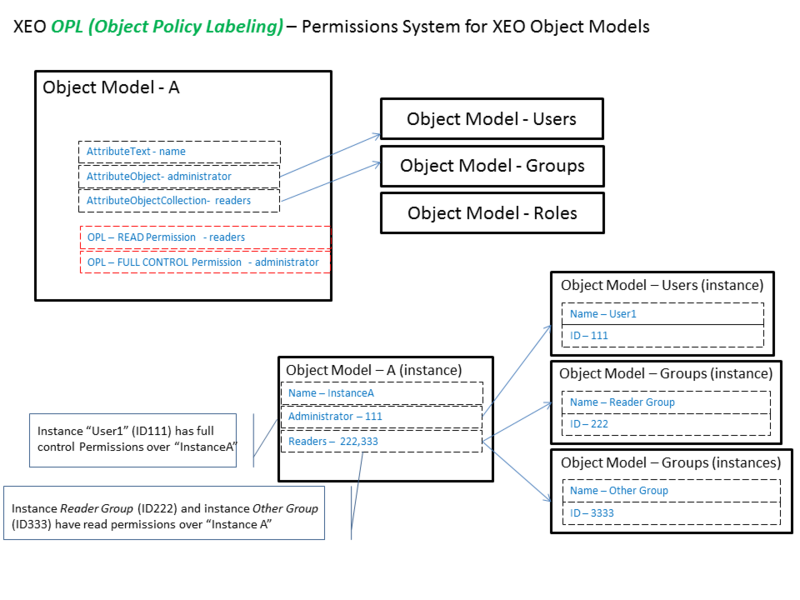 XEO has a feature named Object Policy Labeling (OPL) which helps to create a permission system for a specific Object Model Instance or, more broadly, for an Object Model (or an attribute or method of the Model). The first security mechanism is called Object Model Permissions. Object Model Permissions allow you to specify which set of users can read/write/add/remove or execute certain XEO Model Instances, Attributes or Methods. For example, if you have a XEO Model representing your company projects (named Project) and each project has an attribute representing the total income of the project, you may want that value to be only viewable by a manager, as such, you can create a rule that allows only users of the groups "Managers" to read the attribute "Total Income" of any instance of the "Project" XEO Model and that will be a system wide permission. Object Model Permissions permissions are runtime permissions, i.e. they're defined using XEO's administration interface. These permissions are also known as Policies. When creating an instance of a XEO Model, we can determine who has the permission to read the instance, change the instance, delete the instance or have full control over the instance, these type of static permission declarations are called AttributeKeys (there's a more dynamic alternative, called ClassKeys. 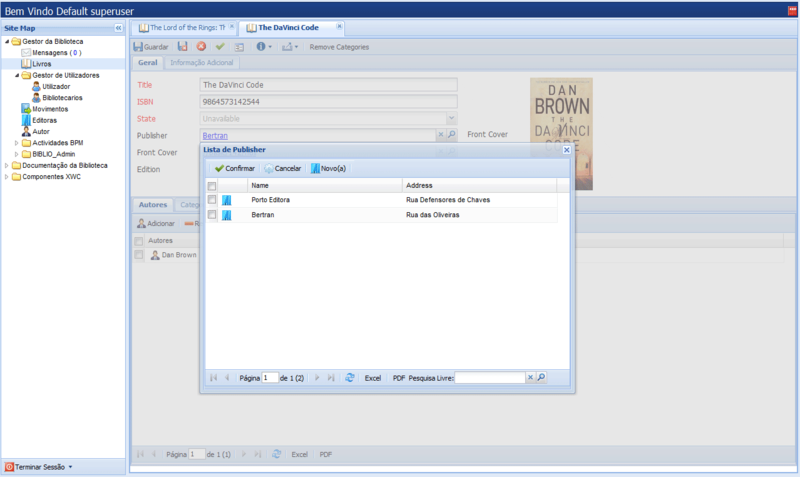 The main idea is to give read/write/delete/full control permissions to instances of a User/Group/Role XEO Model which means a given XEO Model must declare an AttributeObject relation to a User/Group/Role and then a read/write/delete/full control permission can be given to the User/Group/Role instance to which the first relates to. Figure Concepts.3 depicts and example of OPL usage. There's also the possibility to create user-defined permissions by implementing specific interfaces. Implementing these interfaces allows great liberty for developers which may define complex permission rules, such as "a given group can only change instances on even days between 13:00 and 15:42", these are known as Class Keys. Most object-oriented languages have concepts like Inheritance and Interfaces (of some sort). XEO being a Java-based framework makes use of those concepts in its XEO Object Models. When creating a new XEO Object Model you can extend an existing Object Model (and inheriting all of its attributes, events and methods). If needed, all of these can be overridden in the new Object Model. Extension can be seen just like in a regular object oriented programming language (there's no multiple inheritance, like in C++). A XEO Interface is similar in purpose to a Java Interface, meaning that XEO Models that implement the XEO Interface share the same type, but contrary to Java Interfaces, in XEO Interfaces you can define regular object attributes, events and methods and when an XEO Model implements the XEO interface it will inherit all of the interface's attributes and events (not methods). In figure Concepts.4 an example of Object Model extension and Interface Implementation is depicted. Figure Concepts.4 - XEO Model Extension and Interfaces, how inheritance works. In most applications there's a notion of entities that can only exist if another entity exists, or more properly, an instance of an entity can only exist if another instance of an entity exists, frequently this is called a parent-child relationship where the child cannot exist without its parent. XEO mimics this behavior with the Orphan/ Non-Orphan Concepts. Contrary to what its common in our society, the most common types of XEO Models, are Orphan. This means that instances of that model can exist without the need for a parent (hence the term "Orphan"). Instances of Non-Orphan Object Models can only exist in the context of a parent instance. XEO will only allow to create instances of Non-Orphan Object Models, if there's a parent instance and the visual layer will reflect this situation. A good example of Orphan/Non-Orphan relation is the Invoice/Invoice Line example. An Invoice would be an Orphan Object Model and the Invoice Line would be a Non-Orphan Object Model. XEO Object Models can be logically grouped in XEO Packages, which helps organizing an XEO application. XEO Packages can have sub-packages to further organize the application structure. XEO Packages do not, however, separate Object Models by namespace or package name, this means that if you create two objects with the same name in different XEO Projects, only one will make it your to application. Along side XEO Object Models, XEO has the concept of a XEO Lov (List of Values). XEO Lovs are basically key/value pairs of identifiers and labels, which can be used as the values for an Object Model Attribute. If a given XEO Model represents a Person and it defines an AttributeText representing that person's country, you can restrict the values of the Attribute to existing countries by using a XEO Lov. XEO Lovs are statically (at design time) created, but their values are stored in the database, as such, the list of values can be changed overtime. At the heart of the XEO Framework is the XEO Builder. The XEO Builder is responsible for most the "magic" behind the scenes, which is analyzing all XEO Models and creating the underlying support structures. Each XEO Model is converted to a Java class (which is later compiled for use within your application) and database tables are created to support the current Object Model as well as auxiliary database tables (to support AttributeObjectCollections with other Object Models). The XEO framework, includes a set of System Object Models, which are required for the correct functioning of a XEO application (namely Objects representing groups, users, security features, etc...). When creating a new project, all XEO Models will be "built" by the XEO Builder and all other required structures will also be created. Each new XEO Model added (or changed) to the project, does not require a complete build to the project. The XEO Builder is clever enough to detect changes to existing XEO Models and build only the required ones. The XEO Builder is integrated in XEO Studio, the primary development environment for XEO application, so that any new Model (or change to an existing model) will be automatically processed. The XEO Framework was created to produce web-applications, as such, it requires a visual layer in the form of web pages so that users can interact with instances of XEO Models, such interaction includes listing instances, editing specific instances or searching a specific instance. XEO's Visual Layer is a component based layer, in which the combination of components creates the desired layout for the application. The component layer (named XEO Web Components) is based on Java Server Faces (JSF base components are actually usable along with XEO Web Components). List, Edit and Lookup Viewers are designed to deal with instances of XEO Models, but are not limited to that. Most XEO Web Components are independent from XEO Models and can be used to create interfaces that have nothing to do with them, i.e. you can create customized viewers to satisfy your own requirements. 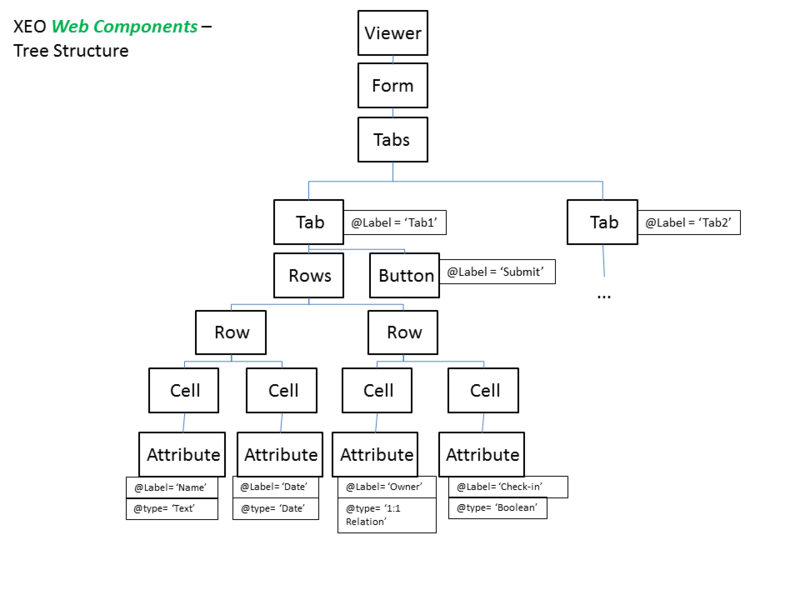 Main Viewer (Defines the application structure, elements in the tree structure will be open as tabs in the white section of the figure, see examples in the following figures). Edit Viewer (Viewer to edit a specific XEO Model instance - you can edit simple (text, numeric, date) attributes, relations to other instances (single or multiple) and the layout can be arranged in different ways using XEO's Web Components). Lookup Viewer - Viewer used to search for a specific XEO Model instance (when you want to relate an instance with another instance, or add an instance to an object collection, for example). The XEO Web Components layer is responsible for the translation between the XML definition of the viewer and its rendering to the web-browser, an example is seen in figure Concepts.10 where the XML definition is converted to the HTML rendering seen on the right of the figure. In the next chapter you can learn more about XEO's internal architecture.